The littlest one is an avid reader and gets really upset if he loses the place in the book where he stops. So his father told him about a nifty little thing that will solve his problem, called a bookmark. Ever since then, he has been bugging me for bookmarks. It happened again this evening and I thought I should just do a simple bookmark craft with him. As usual, I surfed. (I am hopeless at art and craft stuff so I rely heavily on the internet for help.) Then I remembered reading about page corner bookmarks some years ago, and I thought it would be easier for a 4 year old to use than the usual kind. It won’t fall off the book so easily (I hope). I googled and found this site that has pictorial instructions – important for an Art & Craft idiot like me. So I got the boy all excited about doing craft and set about getting the project going. It didn’t go that well. I will explain later. We managed to make one and he was happy to use it on his book. As I said, it didn’t go that well. The reason is because the method explained in that website is hard for small hands to do. I did 99% of the work, which is not good as far as child participation is concerned. You have to measure out squares, draw them, cut them. 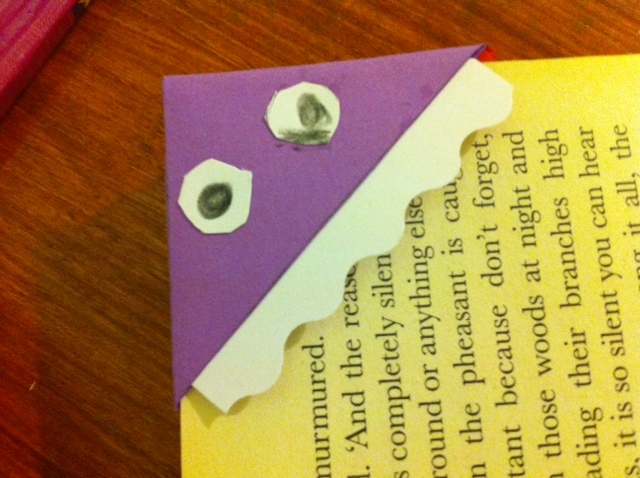 Therefore, after I sent the boy off to play with his monster bookmark, I surfed some more to see what else I can find. Hopefully, something more child-friendly. I found another site that uses a different, much simpler method. This one I am sure the boy can do. But just to be sure, I tried it out first. It took just a few minutes for me to make the one below using my craft punch. 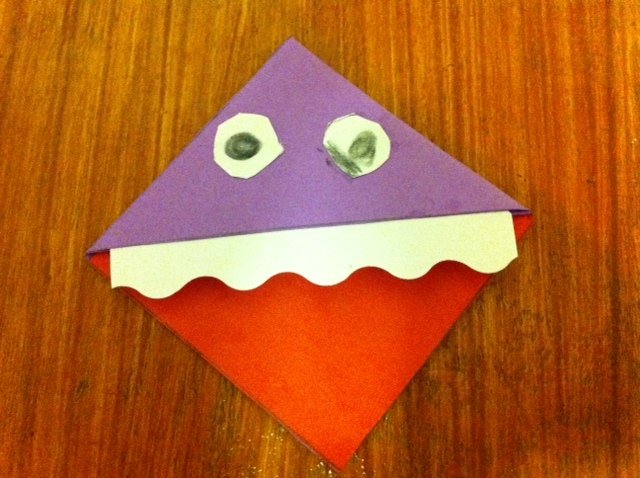 All you need is just a square piece of paper, fold diagonally, cut out the unwanted triangle portion – which a 4 year old can do effortlessly – fold in the sides, glue, and you have it. 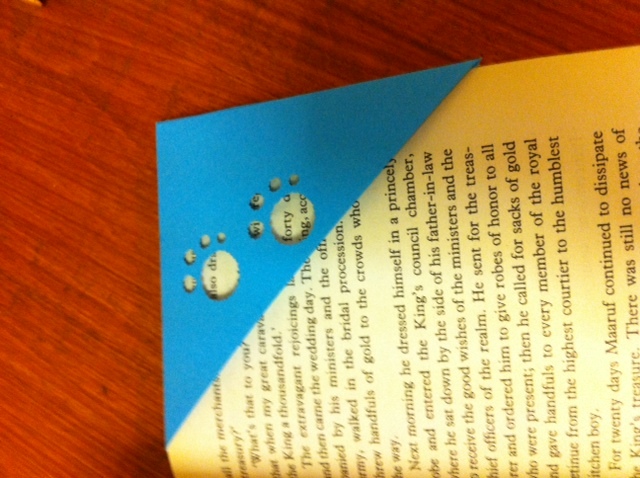 Simpler page corner bookmark using craft punch. As for decoration, craft punch or otherwise, it is a matter of creativity and preference. As my perceptive 7 year old said, it is just to make sure you won’t get confused over which side is the right side, and therefore won’t lose the page where you last read. My interest is piqued and I am going to surf some more. If I find any more information, I will post again. In the mean time, if you just want a fuss-free version, print the pdf template out from this site. It can’t get any easier than print and cut.